Rent 6 nights and get the 7th night FREE! (some restrictions apply) Call our number (316) 788-6303 for Additional Year-Round Discounts! Great for family reunions and groups. Lots of room with over 2000 Sq. Ft. of space. Elbow room for everyone. Our large four bedroom townhouse with ground level entrances, is a quiet comfortable home sitting atop a hill with a beautiful view of the wooded Ozark hills. Step back in time at Silver Dollar City and the Showboat Branson Belle! Visit the many amusement parks. Shop till you drop! Take the kids to a day of fun on 'The Strip'. See one of the many live music shows! Spend a day at golf or fishing. Then return to a quiet, restful home away from home. Relax and breathe in the fresh mountain air on the large furnished deck with a fantastic view of the surrounding Ozark hills! Check out the abundant wildlife. You will enjoy it so much you will want to come back again! The main level of our two-story townhouse has a King size Master bedroom suite with a private bath. The guest room has a queen size bed with main bathroom nearby. The great room has an electric fireplace and queen sleeper-sofa, fully equipped kitchen, washer/dryer, iron and ironing board, Cable TV with DVD player, and Internet connection. The large dining table has seating for 8-10. The carport/patio has a ceiling fan/light for your outdoor comfort while grilling on the Weber Gas Grille. There is a large furnished deck off the great room. We even furnish a PackNPlay and high chair for the little ones. The lower level has two king-size suites and can be accessed from the inside stairway or ground level parking in the rear. One of the lower level suites contains 2 King-size beds and the other suite has a King and a Queen bed. Both suites have private full baths, 32' Flat-screen cable TV's and mini-kitchen with table and chairs, microwave, mini fridge, and breakfast service for four. Located at Notch Estates on West Hwy 76 just 1 mile to Silver Dollar City and just 15 minutes from Branson Music Shows and all the things to see and do on the 76 Strip. Additional Townhouse and Condominiums available for larger groups up to 76 people. No high rises block the view for this townhouse. (3) An additional microwave has been added to the kitchen making 4 total. The balcony has dining seating for 10. All rooms are wheelchair accessible. Very Clean and spacious for a large group! This place has everything you will need! I would highly recommend this unit! Thank you very much! We do strive for our guests to have that "home away from home" experience by providing the little details. We hope to see you in the future! I would stay here again. It was very nice. We had a really great time. We had 8 women that stayed in this spacious condo!. Everything was great! There is one minor thing that you might want your maintenance department to look at - the dishwasher did not run correctly. Other than that, we liked it so much we are planning returning next year! 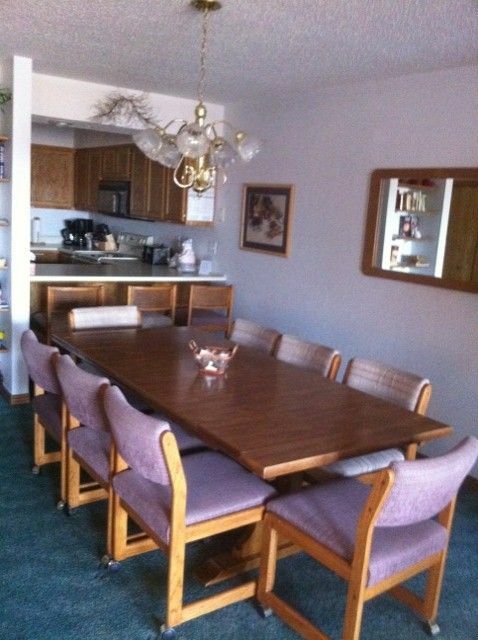 This space is nice for large family gatherings, however it is in need of some TLC. Linens are very worn & stained, small repairs need tending & carpeting is worn & dirty. We had to wash a load of towels before use because they had a sour smell. Laundry facilities & soap were provided in the unit.